Well, we've returned safely from the beautiful weather of Oceanside, California, to the oven-like temperatures of Arizona. As always, we loved the time we spent with the Peck's. And as always, the 78 degree days with ocean breezes will be sorely missed :) What a much-needed break, though. It's the best therapy I've had since Samantha's birth. Almost every day we spent time at the beach - Jorde in the water, and me sitting on the beach, soaking up the beauty and sounds (while reflecting the sun's rays with spf 55 - if you weren't wearing sunglasses near me, you were likely to be blinded by the whiteness!). I love the beach. It's the best place to slow down, to let go of anxiety and sadness, and appreciate the wonder of the world around you - the little birds that run back-and-forth, away from and into the surf looking for dinner; the squealing toddlers making their first foray onto wet sand (some do NOT like having dirty wet toes! ); the old couple walking along holding hands; the sounds of the ocean and seagulls and the laughter of tween-age girls (no longer children but not yet women - I love the innocence they still possess). It's all so beautiful. How can you not believe in the glory of God while surrounded by all of that? 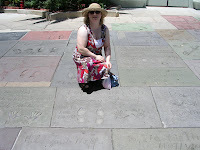 We also visited Grauman's Chinese Theater and saw the hand- and footprints of movie stars, and walked along the Walk of Fame (aka: the sidewalk). It was really cool, and we found the prints of one of my all-time faves, Jimmy Stewart. 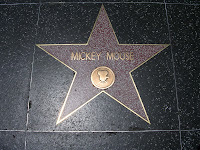 Of course, being Hollywood, Yoda, Spiderman and a muppet (Elmo, if I remember correctly) were walking along the sidewalk as well, handing out promotional stuff and advertising for whatever was happening later that evening, or week.